VC-480 V Indutherm Casting Machine Common Process for Melting New programm control system Thanks to a new control panel with real text LCD display, all programs and parameters are very easy and comfortable to set. 100 casting programs guarantee fast operation and consistent casting results. For all major alloys, e.g. for AGS, Alpha Plus, Heraeus, Legor and Pandora alloys, the parameters are preprogrammed. That means for you in practice: from the first flask on, you can expect good casting results without making expensive pretests.Turbulence reduction softwareThis is a new system for a faster and more laminar metal flow. The Indutherm Vibration SystemThe vibration technology (pat. pending) is the most important of all technical features. Independent scientific studies show that: Vibration improves material flow and hence the quality of the mould filling, particularly with complicated moulds. Castings exhibit a higher and more consistent density for all tested alloys and shapes. Porosity is substantially reduced. Risk of hot cracks is reduced. 50% smaller grains Castings have greater stress and elasticity properties, making them easier to process further.Vibration technology now also in the mid-size class: the highly economic vacuum pressure casting machine VC 480 V Equipped with the INDUTHERM Vibration System for optimized form filling and castings with reduced porosity, finer grain and optimum post-processing properties. 8 kW induction generator, variable vacuum in the flask chamber. Crucible volume max. 170 ccm = 2,5 kg Au 18 ct Flask size Ø 130 mm x H 260 mm Temp. max 1.600° CSpecification: performance performance max. 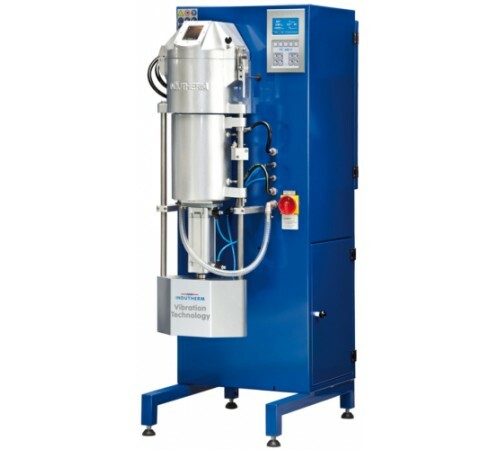 / electrical connection 8 kW 3x400 V maximum temperature 1600° C capacity crucible volume 170 ccm = 2,5 kg Au 18 ct * for use of flasks up to ø 130 mm / 240 mm H handling+control maximum pressure 1,5 bar programs 100 program control LCD-Display, full text display ..
100 casting programs guarantee fast operation and consistent casting results. For all major alloys, e.g. for AGS, Alpha Plus, Heraeus, Legor and Pandora alloys, the parameters are preprogrammed. That means for you in practice: from the first flask on, you can expect good casting results without making expensive pretests. Vibration improves material flow and hence the quality of the mould filling, particularly with complicated moulds.